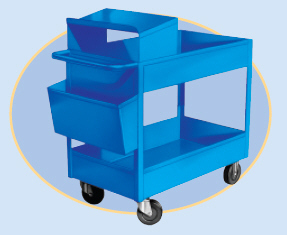 UT Utility Truck - Roll-A-Way Conveyors Inc. These utility trucks are absolutely perfect for shipping and receiving areas. Note the writing space, and the separate compartment for bills of lading, etc. All steel, 16 gauge. 5” x 1-1/2” cushion rubber wheels. Optional with stainless steel. Bumpers available. Powder coated blue.